Nonetheless, FFGs have proven to be a useful and durable classification system, and tabular summaries are available for many taxa (see Mer-ritt and Cummins 2004, Tachet et al. 2002, Poff et al. 2006). The ability to view a macroinverte-brate assemblage as a collection of FFGs provides valuable insight into which food resources are prevalent, and allows one to observe how different groups oforganisms respond to environmental variables. The distribution and abundance of these resources are influenced by size of stream or river, shading, substrate, and many other variables discussed previously, and it has been suggested that the relative availability of food resources changes predictably from headwaters to river mouth (Vannote et al. 1980). 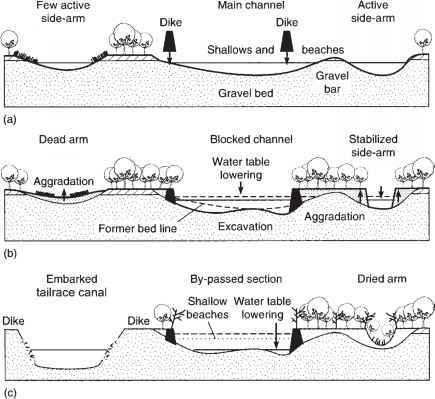 Thus, food webs also should vary in a predictable fashion: shaded headwater streams will favor organisms that consume POM, whereas grazers of algae should flourish in unshaded, stony streams, and fine particle collectors are likely to dominate in large, turbid rivers (Figure 1.7). FFG ratios also hold promise as indicators of stream ecosystem attributes. For example, an ecosystem whose metabolism derives mainly from autot-rophy should have a high ratio of scrapers to shredders plus collectors (Merritt et al. 2002).